The Springbok Sevens team are not dwelling on what happened in Dubai last weekend, according to Rosko Specman in the build-up to his final tournament for the Blitzboks in Cape Town this weekend before he shifts his focus to fifteens with the Vodacom Bulls. “We did some good and bad things in Dubai, but that performance does not define us, neither will it dictate to us what we want to achieve in Cape Town this weekend,” said Specman, who will be playing in his third tournament at the HSBC Cape Town Sevens. The Blitzbok flyer is adamant that the South Africans will be coming out with real intent and purpose, not only to prove to themselves that they are still world beaters, but also to the expected sell-out crowd at the Cape Town Stadium this weekend. The winger, who scored three tries in Dubai last weekend, is not going to necessarily try and bow out in spectacular fashion. “My responsibilities are within the team and I know what my role entails,” said Specman. Another player keen to contribute is speedster Siviwe Soyizwapi. “We are proud of the work we put in at training and how we perform at the tournament,” said Soyizwapi. “Our performance in Dubai obviously was not what we stand for as a team. We will be looking at the positives though, as we are at home, playing in front of fans, family and friends. One of the highlights of the South African performance in Dubai was that of Muller du Plessis, who travelled to Dubai for the first time and scored six tries. He will also play for the Blitzboks in Cape Town for the first time. “Yes, I am very excited about this weekend,” said Du Plessis, who matriculated in Paarl and still played for the SA Schools team last year. The Springbok Sevens team will join in the centenary celebrations of the life of the late Nelson Mandela by playing in a specially designed Madiba-jerseys at the Cape Town Sevens. Mandela would have turned 100 years old in 2018. He passed away on 5 December 2013 and three days later, the Blitzboks dedicated their Port Elizabeth tournament victory at the Nelson Mandela Bay Stadium to his memory. The idea to play in the Madiba-style jerseys originated with team sponsor Castle Free and along with SA Rugby, ASICS, the official apparel and footwear supplier to South Africa’s national teams, and the Nelson Mandela Foundation rolled up sleeves to make it happen. The jersey takes its green-and-gold design inspiration from the intricately patterned shirts Madiba was famous for wearing. 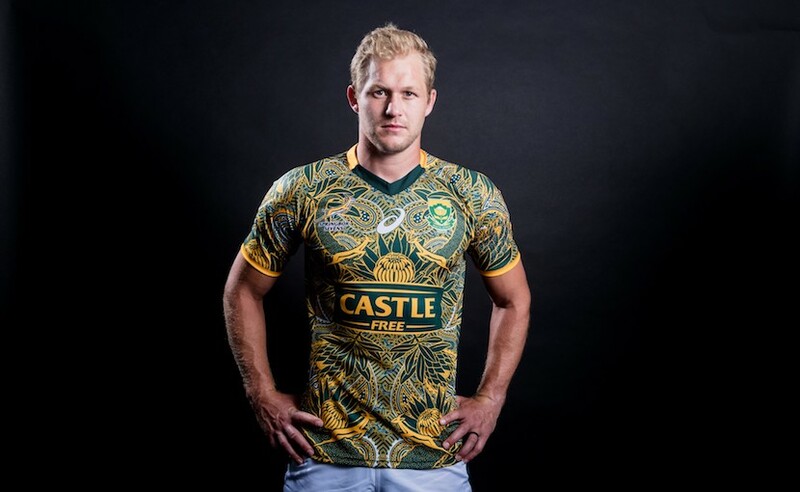 “The entire country celebrated the life of Nelson Mandela this year and we’re honoured to also have an opportunity to pay our respects as in this specially designed ‘Madiba’ jersey as part of SA Rugby’s contribution to the centenary celebrations of our first democratically-elected president,” said Philip Snyman, captain of the Blitzboks. Castle Lager’s Brand Director, Vaughan Croeser echoed Snyman’s words by highlighting how the historic Castle’s brand vision of bringing South Africans together aligns with that of freedom fighter, Nelson Mandela. “The idea of designing these iconic jerseys is the brand’s way of honouring Madiba’s legacy,” said Croeser.